Prolific and controversial political cartoonist Badiucao has made a career out of tackling China’s difficult political and social issues. A new ebook Watching Big Brother: Political Cartoons by Badiucao collects his work and offers a glimpse into Badiucao’s perspective on the state of free speech in China. Born in Shanghai but now residing in Australia, Badiucao utilizes satire and pop culture references — even Communist Party propaganda images — in his cartoons to get his point across. A contributing artist for China Digital Times, his work has been used by Amnesty International, Freedom House, BBC, and CNN and has been exhibited around the world. 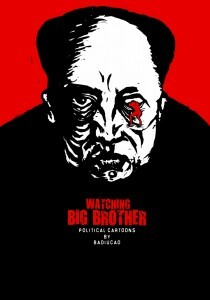 Watching Big Brother, published by China Digital Times, collects more than 50 of the cartoonist’s more controversial cartoons as well as commentary on each piece and an extensive interview with Badiucao himself. From his critique of President Xi Jinping and the Communist Party to his feelings on free speech, Watching Big Brother — the title an homage to George Orwell’s 1984 — gives the reader a rare, comprehensive look into Badiucao’s craft. Although Badiucao may have attracted the attention of like-minded people in his fight for freedom of expression, he has also recently come under attack by the Chinese government for the cartoons he posts about the state of his home country. 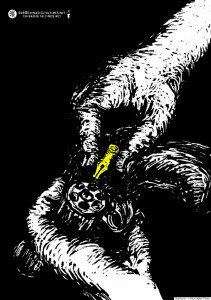 Although the threats initially worked and Badiucao was afraid, “I also understood that the only way to overcome the fear of such attacks was to make them public and to continue to draw.” And that’s what he has continued to do. See additional works by Badiucao on The World Post.